John and I had the great honor of seeing the HAWAIIAN MONK SEAL up close and personal in it's natural habitat on the island of Kauai. Most of the time we scame upon while walking along a beach. All of a sudden we would be within feet of one and not even know it. They come ashore and nap throughout the day and look like boulders on the beach. 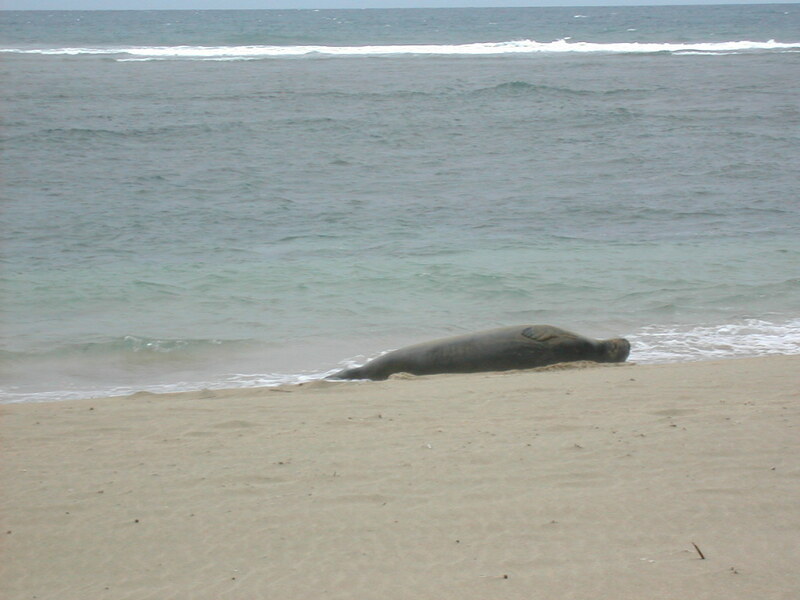 Status: Monk seals, although totally protected, remain one of the most endangered of all seals. 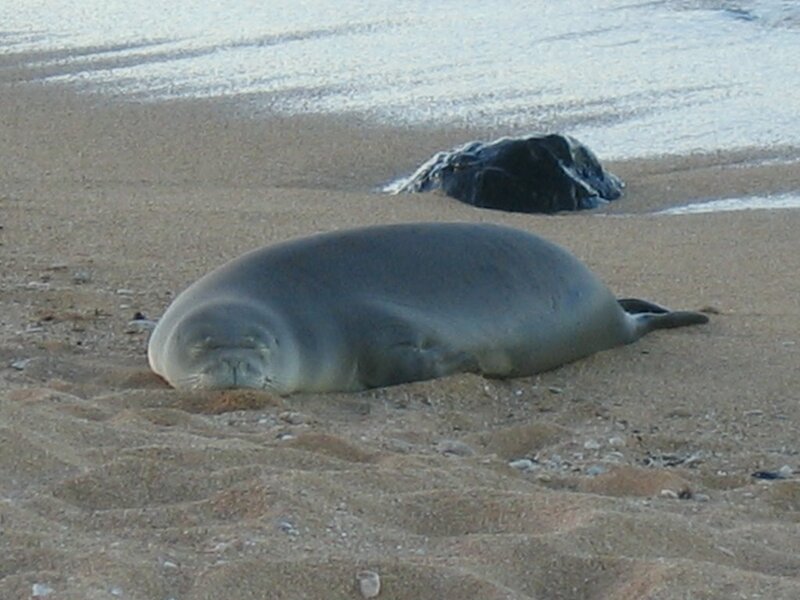 It is estimated that fewer than 1500 Hawaiian monk seals exist today. The Hawaiian monk seal was officially designated endangered November 23, 1976 and is protected by the Endangered Species Act and the Marine Mammal Protection Act. 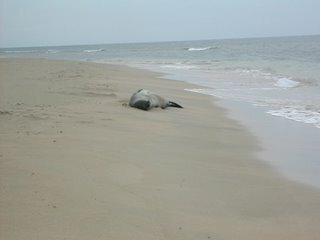 It is illegal to kill, capture or harass monk seals. The law is that you are not allowed within 100 feet of one. state and federal laws. 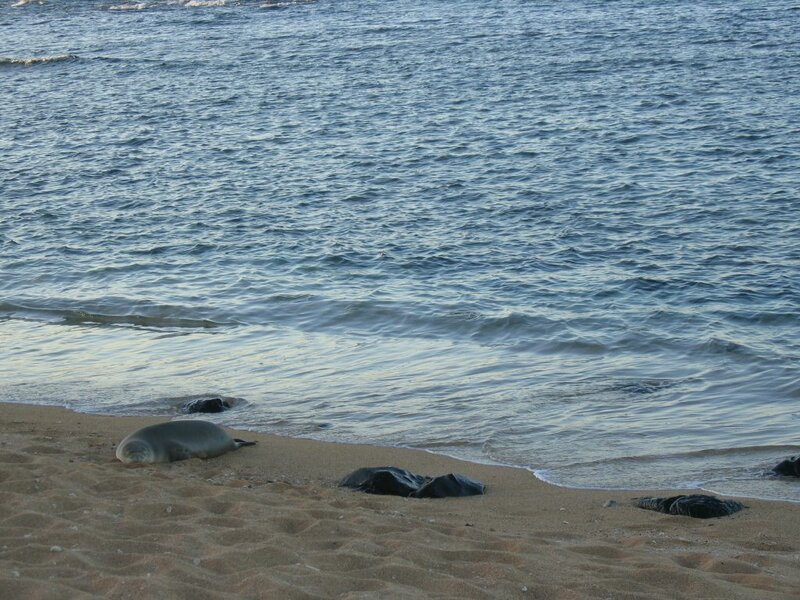 Harassment or disturbance of a Hawaiian Monk Seal can incur fines exceeding $25,000 and up to 5 years imprisonment. Don't get too close!! Thank goodness for that 100 ft. law- I hope you used the zoom function to get that last shot! The seal in that last picture looks like she's having a really nice dream- I love those tightly shut eyes and that smile. ha.. yes I used the zoom on the last one. and isn't that a cute face? I also love ho perfectly round it's back is. so fat! 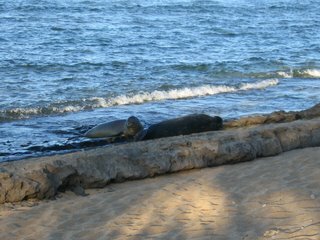 Wow - to have just 'happened upon' monk seals. Your photos are great! That last one is so smoooooooth like a river stone (and yes, such the cute face!). 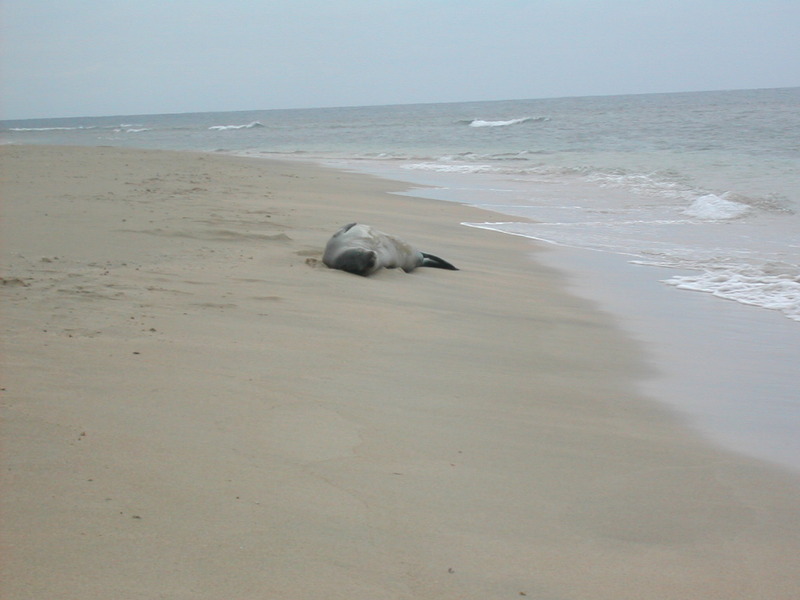 Since designated an endangered species, have the monk seals increased significantly in number? Waaaaay back in the 70's, we used to visit Ano Nuevo Beach in N. California to see elephant seals. 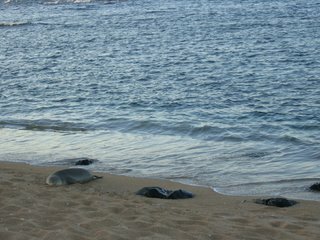 It was possible then to walk right up to the sleeping seals (dangerous but seemed cool to do at the time) and take pix. That was before creepy humans started to harass and hurt the seals. (Groan...why so some people feel the need to do that?!?). Soon barriers were put up and rules posted to protect the animals; as well as to protect humans from getting beat up by any harassed seals. Some of those male elephant seal were big and aggressive (mating season?) and ready for a fight! Thanks for sharing wonderful pix. I also luv the unbelievably gorgeous orchids from previous post!